Delightful ceremony rituals capture the feeling of the moment and give that magical ‘flow’ to your ceremony. There are many ways that we use ceremony rituals to express shared values, and feelings, and emotions and also to provide points of interest and colour in a ceremony. They help you to communicate your thoughts, hopes, values and emotions without necessarily using words. Contact me here for delightful rituals and symbols in your ceremony. Lighting a candle or candles is a popular ritual in ceremonies. The light of the flame symbolises hope, and the warmth of the flame symbolises love. This symbol creates a powerful focus in a ceremony. Celebrate the love and good wishes of people who are unable to attend the ceremony in person, or honour the memory of loved ones who have passed. 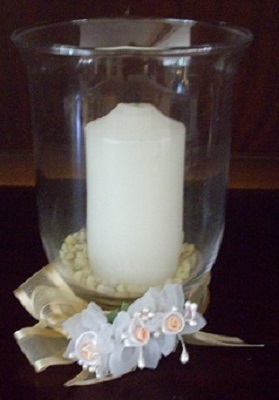 In a Wedding ceremony, a Unity Candle generally signifies the forming of a new family. Use a candle ritual in a Renewal of Vows ceremony to express refreshed promises, joy and celebrate a shared journey. In a Naming ceremony, a lighted candle symbolises hope for the future of the named person. In a Celebration of Life/Funeral/Memorial ceremony, a lighted candle represents the spirit of life or contribution to life, or the legacy of a life journey. A candle snuffer is a tool that is used to extinguish lighted candles. The action of using the candle snuffer signifies acknowledged endings and shows closure. I have an elegant silver candle snuffer that not only looks amazing but is also easy to use in ceremonies that I conduct. The symbol of sand is a popular choice for a ceremony ritual. Pour different coloured sands into a vessel and watch as they combine to create unique patterns. The grains of sand express the many and varied gifts and contributions that people make to our lives and the patterns express our different life paths. In a Wedding ceremony, combined sands symbolise the blending of two lives in marriage. Different colours often reflect special meanings or values according to different cultures. The grains of sand mingle and combine to form unique patterns that symbolise the unique life patterns and pathways of a shared married life. In a Naming ceremony, coloured sands represent the hopes and dreams of the family, or the values and beliefs of the family that will guide the named person throughout their life. 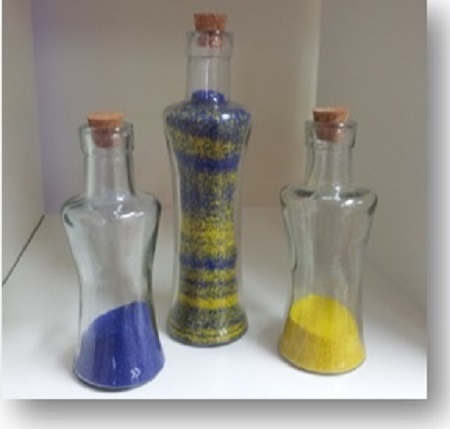 There are other delightful ideas to combine sands, or other elements such as glass beads, and coloured oils into special keepsakes. Use the symbol of hands in a ceremonial ritual as an intimate gesture to express love, commitment and sharing. It is a great way to steady nerves, and both participants and guests understand its message. A Joining of Hands is a lovely and warm ceremony ritual. It expresses the hopes and dreams that two people bring to their relationship. In a Wedding ceremony, the couple may join hands as part of the ‘Declaration of Intention to Marry’ or ‘Betrothal’. As the couple makes their binding marriage vows, they may like to join hands in a ceremonial ritual of assurance and love. Although this is a simple action, it is also a powerful message that all people understand. A Joining of hands is a simple and lovely ritual that is meaningful in other ceremonies including Commitment, Engagement, or Renewal of Vows ceremonies. Wonderful readings express in simple words, the importance of the contributions of both parties. The couple affirm these contributions not only in establishing but also in maintaining a loving and lasting relationship. A Handfasting Ceremonial Ritual is a very special hands ritual. It is a delightful ritual that is as simple or as colourful as you like. 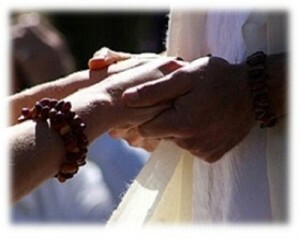 There are many versions of the handfasting rituals and you are free to create your own version. Handfasting symbolises the making of a promise or a covenant, and is often included in Engagement and Wedding ceremonies. 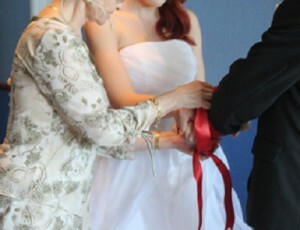 Choose a single ribbon, or a number of ribbons, or combine different materials to create a handfasting chord or braid. Different colours represent good wishes for the couple, or shared values of the extended family. This chord or braid is made either before the ceremony, or as part of the handfasting ritual itself. Invite family members and special friends to take part in a handfasting ritual. This is a great way to involve people who otherwise may not have an active role in your ceremony. 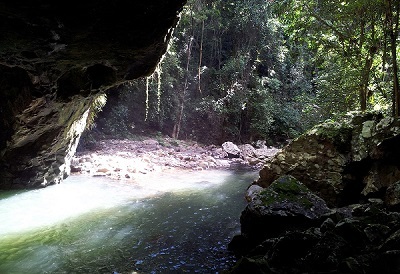 The symbol of water represents cleansing or purifying in many cultures. The action of pouring water marks a fresh beginning. This may be at a new stage in life, or on an anniversary. In Wedding ceremonies, the ritual of washing of hands or feet symbolises the moment when a couple start their new, shared married life. Use water, or your liquid of choice, to seal or to refresh a promise in ceremonies such as an Engagement or Commitment, as well as Renewal of Vows. A Loving Cup Ceremonial Ritual is a very old and traditional ritual. This ritual originates from the celtic tradition and celebrates the union of two people. 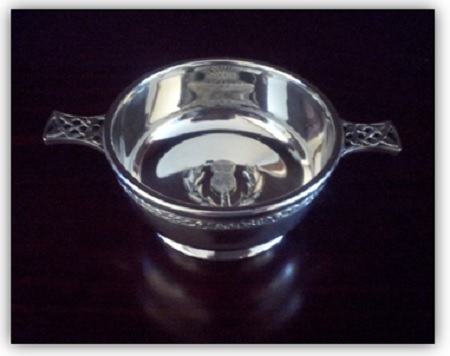 A loving cup is a drinking vessel (chalice or quaich) usually has two handles. Two people hold both handles and take turns to sip the water or other beverage from the cup. Alternatively, one person holds both handles and sips from the chalice or quaich. That person then passes it on to another person. Also, in rituals that celebrate togetherness, people form a small circle and take turns to sip and pass the quaich around the group. In a Wedding ceremony, the couple drinks to the love that is past, the love that is present and the love that the future will bring to them. 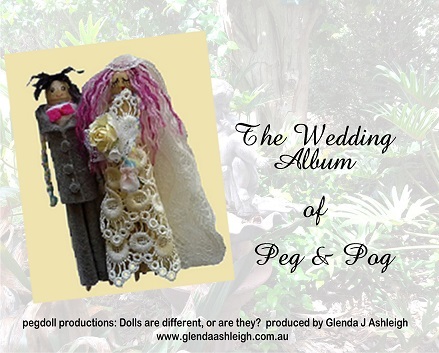 This delightful ceremonial ritual not only adds a special touch to Betrothal or Engagement ceremonies, but also to Commitment and Renewal of Vows ceremonies. This particular Quaich is very special to me as it comes all the way from the Blacksmith’s Shop at Gretna Green in Scotland. It is a special and romantic touch especially in Wedding and Renewal of Vows ceremonies that I conduct. I also use it in wonderful Naming ceremonies that include a water ritual.